ARE THEY SAFE? Yes, all modern flueless gas fires sold in the EU must have CE approval and include an ODS safety device. This will switch off the fire in the event the air vent is blocked. If you are thinking of buying a wood burner and are worried about safety you should consider that a wood burner by law requires a CO alarm installed in the room with the appliance, the former fire does not. That should confirm that the fires are safer than other styles of heating. THE SAP RATING IS 90%. You can install one in a new build property. The regulation states that due to the air vent in the same room as the appliance the gas fire must be rated at 90% not 100%. This is not the official energy efficiency rating of the fireplace, that is 100%, the SAP rating of 90% is greater than any other style of fireplace when installed in a new build property. During SAP calculation, ignore the air vent and input efficiency rating only. Choosing the correct air vent is critical if you want to enjoy the full benefits – energy efficiency and heat. The air vent specified in the installation manual will state a “minimum amount of free air” – this is not the size of the vent (common mistake) this is the volume of air which passes through the vent. If a smaller vent is fitted the fire will be unreliable and shutdown. The same will happen if the vent is blocked. The vent is there to add fresh air to the room – not to take air out. Buying a high quality air vent for around £40 will save considerable cost in the long run. An air vent in the room is required to provide fresh air ventilation to replace the air used by the fire. The air vent does not cause drafts if a high quality vent is chosen and fitted correctly. 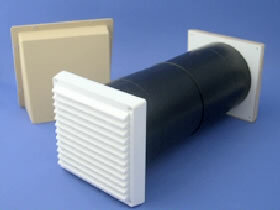 WE CAN SUPPLY A VENT WITH YOUR PURCHASE. The air vent is allowed to be used in both in new and modern homes as it complies with the SAP regulations for ventilation. The air vent must provide a minimum amount of “fresh air volume”. This is a trickle of fresh air to replace the air that is being used by the fire. The vent positioning is important as it must be installed over 1 metre away from the fire. How do they work? Are they safe? What about the fumes? These are all normal questions. If you are unsure of the technology involved please call our sales team Monday to Saturday on 01325-301020. Measure the room dimensions – H x W x D in Metres. Calculate the “Total Volume” of the room. For example = Length 3.2m x Width 3.6m x Height 2.4m = 27.65 m3. Make an allowance for furniture etc as this will reduce the amount of “air” in the room. Typically you should consider that some of the room volume is taken up by furniture. Check the “Total Volume” calculated above against the figure stated below as the “minimum” room size. For example the calculation above would mean the owner of this property could buy an Azar, or a natural gas Classico, Moderno, Retro, Angel, Kiah Suite, Corona Suite or Bonita Suite. Use the reference table below to select the most appropriate fire for your property based on the required room size and the required free air vent. To Calculate your Internal Space simply multiple the length by the width, by the height, to calculate the volume in m3. The remote control version of the Angel, Fireline, Moderno, Corona or Kiah is only available as a 3.5Kw Fire. Which Power should I go for? If the area of the room is bigger than 100m3 we advise buying the 3.5Kw version. If the area of the room is smaller than 100m3 we advise buying the 2.7kW version. NOTE: the area is in M3 and is calculated by Height x Depth x Width in metres. This type of gas fire is classed as a secondary heat source and the room must have a primary heat source like radiators. We can provide the correct size Air Vent to suit the chosen gas fire from the range. Please ask our sales consultants when placing your order.